Take It Up Wear It Out: Upcycling project: Make Do and Mend meets modern technology! Upcycling project: Make Do and Mend meets modern technology! I have a couple of older pairs with worn fingertips, so I decided to darn these with conductive thread, to make them stronger as well as smartphone friendly. I bought a bobbin of conductive thread online, there's enough thread on it for several pairs of gloves. I have a vintage tool for glove darning (to fill out the fingers so I don't accidentally sew them closed), but a chunky pen, or a spoon handle, would work just as well. 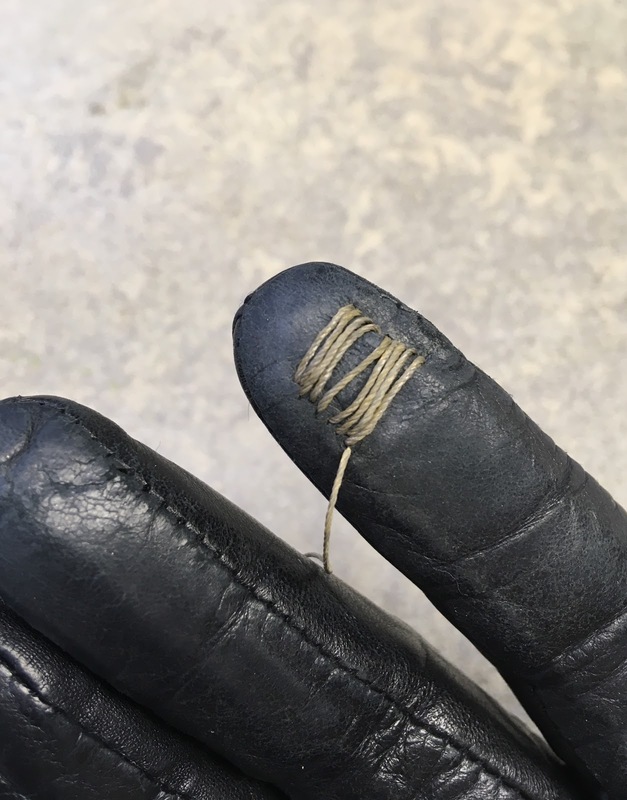 The thread needs to come into contact with your fingers as well as the touch-screen of your phone, so I needed to make sure my stitches went all the way through the fabric of the gloves. As well as darning over the hole in the thumb of this pair of gloves, I stitched a patch on the other thumb and both forefingers as well. I spent a couple of minutes swiping through some apps on my phone first, to work out which part of my finger came into contact with the screen to make sure I stitched the right area of the fingertips on the gloves. To strengthen the worn fingertips and ensure the conductive thread patch would definitely work, these horizontal stitches also run parallel on the inside of the glove. The vertical stitches catch the longer threads firmly to the glove, creating a dense patch that will make contact with my finger and the phone, and won't unravel or get caught on anything. It was really satisfying using my phone with gloves on when they were done! I might not have quite enough dexterity to type a text wearing gloves, but I can use the camera, change my music or answer a call. Now, that's a really great idea! Thanks for sharing. Did you use a regular needle, btw, or a triangular leather one?